(1) was built. In response, (2) was built. What are they? Got a question? Send it to boiledbeans@gmail.com! Plz to be seeing udupendra’s reply for the answer straight from the horse’s mouth. 2 – Russia’s answer, made from jets from a Yakovlev Yak-40 passenger airline. Jet powered trains. (1) is the American M497, (2) is the Soviet comeback. Both are jet powered trains. 1) is the M-497, built in USA. 2) was the Russian counterpart. 1 – M-497, the American one. 2 – Russian response to M-497, fitted with Yak-40 passenger Jet plane engine. American and Soviet (respectively) ‘Jet Trains”. The M-497 holds the US Speed record to this day. 2. in the 70s, the Russkies modified an ER22 to keep up with the jet-train arms race. 2 – Soviet train, SVL. Jet powered Trains. The US’s M-497 and Russia’s response to it during the Cold War era. Trains with Jet plane engines. They were built by USA and Russia. 1. The M-497 (nicknamed Black Beetle) was an experimental jet-powered locomotive test bed of the New York Central Railroad corporation, developed and tested in 1966 in the United States of America. 2. ER22 elektrichka with a pair of engines from the YAK-40 passenger jet on the roof. 1. US Jet train. 2. Soviet’s response. (1) is M-497 aka ‘Black Beetle” made by New York Central Railroad. (2) is ER22 built in USSR in reply to Black Beetle. (1)The first attempt to use turbojet engines on a railroad was made by the New York Central Railroad in 1966. Their railcar M-497 was able to reach speeds up to 184 miles per hour(296 km/h). They both are Jet Powered trains. Central Railroad corporation, developed and tested in 1966 in the USA. The Russian train maker Kalininsky formed the Speed Wagon Laboratory and modified the chassis of one of their ER22 head engines to compete with 1. SVL (Russian abbreviation of “high-speed laboratory car”) was developed in Kalininsky carriage-building factory in the far 1970. Based on the train model ER22 it was able to move by means of two engines from the passenger jet Yak-40, installed at the front. 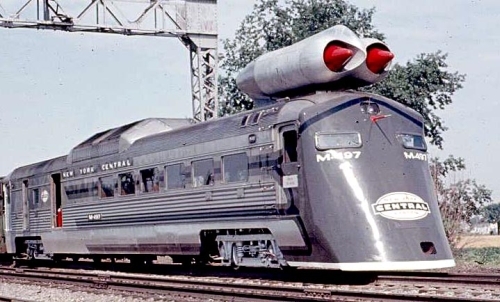 M-497, a jet train prototype built in the US back in the 60s. 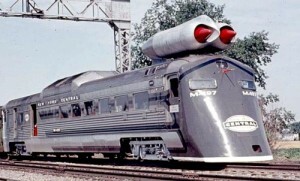 Not to be outdone, Soviet Russia built its own version with engines from a jet plane strapped to a train. Jet (or Turbo-jet) propelled trains. M-497 Black Beetle. 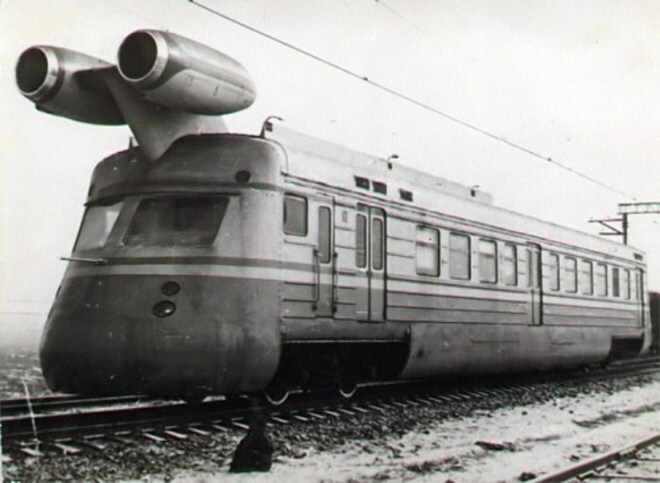 In response , Russia built the ER22 – Soviet turbojet train. 1 is New York Central’s M-497 Jet Powered Train. 2 is Russian Jet Train. 1 was the jet train built by US. In responce, 2 ( a jet train by Russia) was built. (2) Russian “Jet Train” with Yakovlev Yak-40 plane engines. (1)An American train (named Black Beetle) featuring engines from a B-36 Peacemaker bomber. Jet trains of the cold war era, by US and Russia!